Minister for Education and Skills, Richard Bruton and Minister for Children and Youth Affairs, Katherine Zappone today published a report on the quality of educational provision in early years settings. 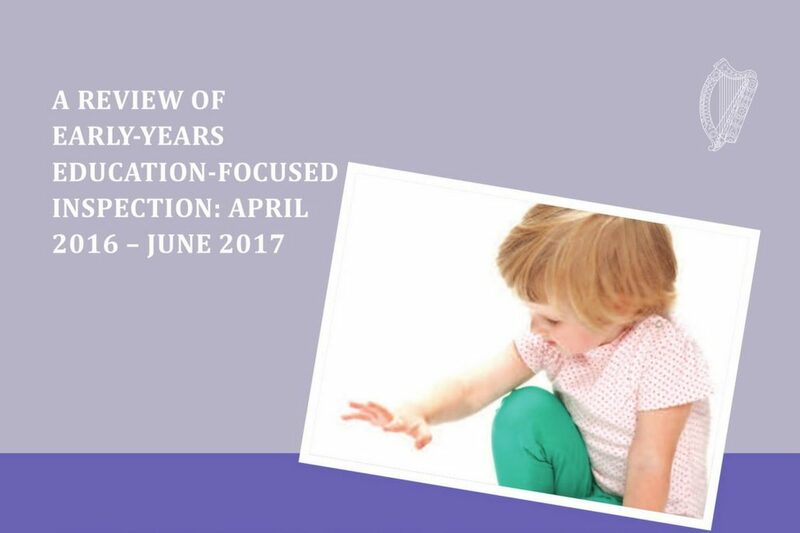 The report confirms that there has been a strong welcome for early years education-focused inspection. These inspections have strengthened the Government’s commitment to provide every child with enriching, enjoyable early childhood experiences and have validated the professionalism and commitment of the early year’s workforce. These inspections also provide robust, authentic information to parents and policymakers about what has been achieved and what still needs to be addressed in the delivery of high quality early education. Almost all Early Years services provide warm, welcoming and safe environments for children and have very good relationships with parents and families. Many services provide a rich range of learning experiences and are providing children with enjoyable, play-based opportunities that promote the development of important learning dispositions and skills such as curiosity, persistence, independence and empathy. Challenges were also identified including; the need for providers to work closely in partnership with parents to support and extend children’s learning and the potential for improving how providers use existing resources such as Aistear and Síolta. The Department of Education and Skills and the Department of Children and Youth Affairs will consider all of the report’s recommendations and work with providers on achieving any improvements identified. Follow-through inspections will be carried out to further assess the quality of early years education provision and practice and to assess progress on areas identified as needing improvement. “This is a very valuable report as it highlights, for the first time, the learning experiences and achievements of children in preschool. It is widely agreed that these early education experiences are critical to young children’s early learning and development and foundational for their lifelong educational achievement. We are committed to making Ireland the best education system in Europe and the contribution of early childhood education has an important role to play in achieving this goal. In partnership with my cabinet colleague Minister Katherine Zappone, we have made good progress in establishing a better understanding of the strengths and challenges of current provision and practice in preschools. We are fully committed to continuing our collaboration to respond to the findings of this report and put in place the conditions for future development and improvement. For more information see the Department of Education Website.